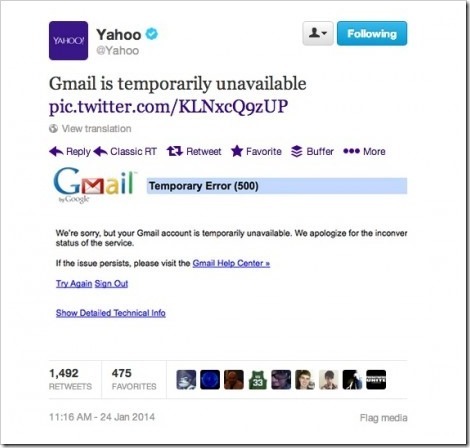 Why Exactly Was Gmail Down Last Week And Why Yahoo Apologized? Last Friday, the entire web communities across the globe were a terrified lot: Gmail was down for 25 to 30 minutes, and there was large scale hue and cry about it. Gmail users were seen frantically tweeting and posting updates on Facebook regarding this outage as millions of users were effected. Gmail, Google Drive, Google Calendar and Google+ were the main services which were badly damaged. 90% of the users faced a downtime of 25 minutes while 10% experienced the downtime of 30 minutes. As per a Washington Post estimate, around 42 million Gmail users were impacted by this outage. What Exactly Happened With Google? After the outage was resolved, Google’s Ben Treynor, who is VP Engineering, posted a detailed blog explaining the reasons for this outage and apologizing for the fiasco. Additionally, Google’s Site Reliability Team conducted an AMA or Ask Me Anything session on Reddit immediately after the outage to give instant replies to the questions. At around 10:55 AM in the US, Gmail’s internal system generated a configuration from the data supplied by a software bug. Now, this internal configuration is highly essential as it instructs other systems how to behave. As this configuration was originated from a bug, it passed on wrong information to other systems for the next 15 minutes, which made all requests from users as null and void. Hence, whenever my Android system was trying to make contact with Gmail servers to release the inbox details, the request was turned down by this configuration file. In fact, the issue was auto-resolved after 30 minutes, as the right configuration file was auto-generated, thereby allowing access to its servers. Although there were murmurs of an hacking attempt as well, but security experts are assuring us that Google’s servers are one of the strongest in the world, and no hacking attempt was made. 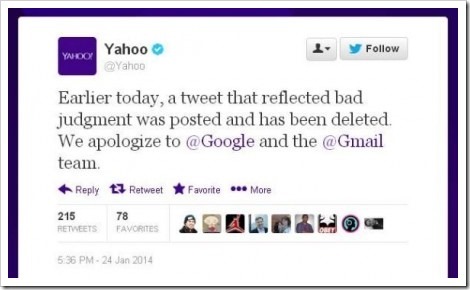 Such technical glitches do happen, and its perfectly ok.
And Why Did Yahoo Apologize? This was not taken lightly, and loyal Gmail users started protesting against this tweet. 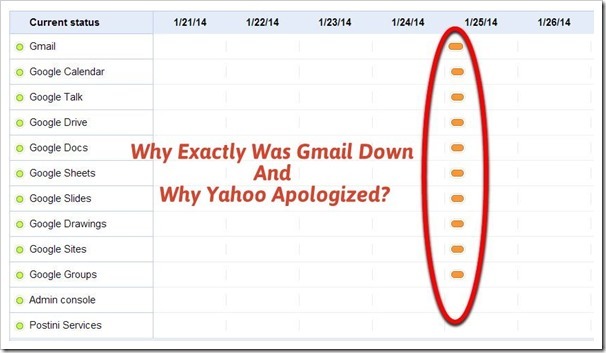 The users reminded Yahoo about their own long periods of outage in the month of December last year, when thousands of Yahoo users migrated to Gmail and they had to render a strong apology. Technological wars on such issues is never boring, so say the least! Technology is no doubt, one of the strongest tools of modern business. But such half an hour outages and technical glitches should not make us cripple with loss of productivity. We should be capable enough to handle such setbacks with grace, and carry on the work. Also, the company in question is Google, who hardly have such blackouts – Given their track record, probably once in a year! And, Yahoo should avoid their marketing techniques in these times of distress; it gives an impression that Yahoo is opportunistic and makes their brand weaker. Air India To Offer Wi-Fi Internet On Board; How About Bettering Must-Have Services First?